When you imagine fireplace mantels, you may think of the stately old marble mantels that you often see in mansions and posh hotels. While these mantels are elegant and timeless, they probably do not fit into the décor of most modern homes. If you are looking for a contemporary fireplace mantel, you have come to the right place. SoCal Fireplace Mantels is your premiere provider for contemporary fireplace mantels in Los Angeles. Whether you like the classic look of a natural stone fireplace mantel or the clean lines of cast stone mantel, we have exactly what you have been looking for. SoCal Fireplace Mantels is a leading Los Angeles contemporary fireplace mantels provider because of our wide selection of materials. We carry natural marble in a variety of colors and color patterns, travertine, sandstone, and all colors of cast stone mantels. Whatever color scheme your décor may be, we have a natural stone or cast stone mantel that will complement it. SoCal Fireplace Mantels is also a leading provider for contemporary fireplace mantels in Los Angeles because of the variety of styles of mantels that we offer. Whether you are looking for clean, modern lines for your contemporary room, or if you prefer something a little more geometric or ornate, we have a design that is sure to please even the most selective customer. If you have a custom design in mind for your contemporary fireplace, we can help. Our talented design team is more than happy to meet with you and develop your own unique, customized contemporary fireplace mantel that fits perfectly with your décor. In addition to being your Los Angeles contemporary fireplace mantels provider, we also design overmantels and precast architectural products, including garden benches, gazebos, fountains, statues, columns, and much more. 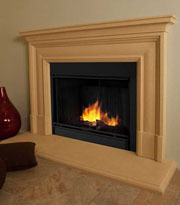 Let SoCal Fireplace Mantels take care of all of your decorative stone needs. Come visit our spacious showroom and check out all of our contemporary fireplace mantels, or call for a complementary catalog to view our products from the comfort of your own home. Whether you stop in or give us a call, our sales representatives are waiting to answer any of the questions that you might have. We offer services in Los Angeles, Orange County and Ventura County.